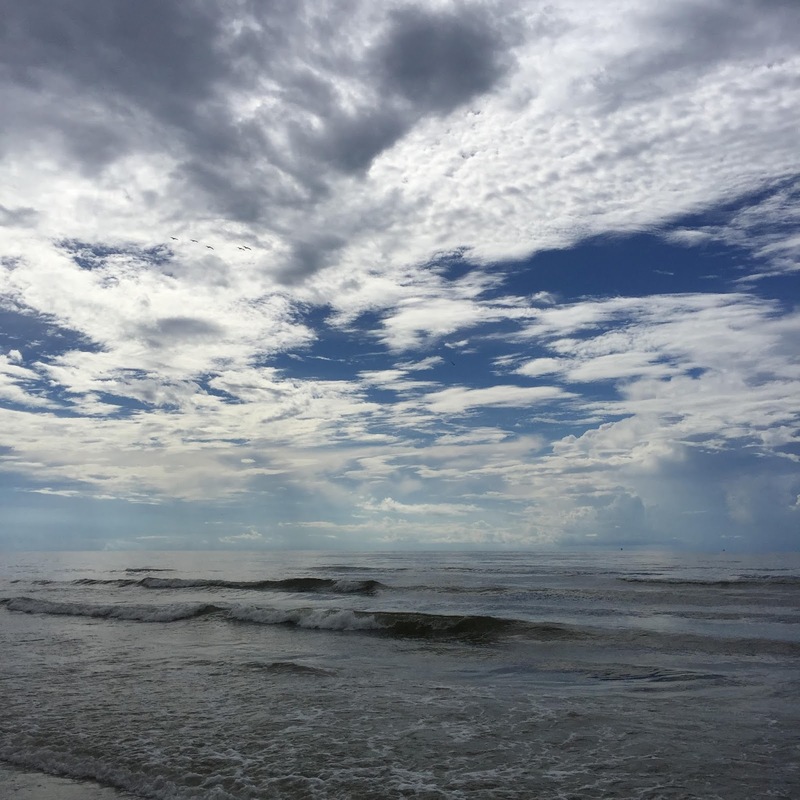 This summer, as I walked along the beach in Galveston, God invited me to lament the lamentable parts of my life. I'd just been reading a passage in a book about the practice of lament; I no longer remember the passage nor do I remember the exact book, but I do remember my hesitancy at the idea of thinking too deeply about the unchangeable things, the unfixable things, the painful things in and around me. I walked in silence, thinking, waiting. Why, I wondered to myself, does it feel as if I'd be doing something wrong if I were to voice to God what aches in my heart? The salty mist clung to my skin, the sun's heat I'd attempted to escape with an early morning walk burned hot on my neck. I felt uncomfortable inside and out. Suddenly I remembered the simple phrases from the psalmist's pen that had kept me afloat toward the end of the spring: God sees. God hears the cries of the afflicted. God has not overlooked. The memory of these words was the invitation again, for if he sees and hears me, then he already knows what pains me. He's simply asking me to voice it. And so I began, tentative at first, brave by the end, telling God what he already knew but what I could only just then admit to myself: mainly that there are costs to following and serving him. There are costs for me in this, I said, looking up at the sky. By that time of the summer, we'd been long removed from our usual routines, and I could see my life back at home with such clarity. The costs scare me, I said. I don't know if I can continue in them, I said, and then I began to name them out loud, one by one, cascading out of me like the waves breaking at the shore. I've known there were costs to following and serving Jesus; the Bible lays it all out right there in black and white and sometimes red. Perhaps that's why we recoil at the idea of lament, because we tell ourselves we should have known what we were in for and that we shouldn't do anything that resembles complaining. Or maybe we recoil because we don't think being a Christian allows for grieving parts of what it actually means to be a Christian. What I discovered that day on the beach is that when we get down to the details and the specifics and the realities of what it means to follow Jesus, when we experience pain because of it, an important part of embracing those costs is mourning them before God himself. I stopped walking, stood where my toes were washed momentarily in the tide, and watched the ocean liners in the distance. As I spoke my costs out loud to God in prayer, I felt as if he was taking them from my hands in order to intently observe, much like I'd done the day prior when my children had brought me a hermit crab they'd found. We'd put the crab in a sand bucket, circled up, and bent over to watch his every move as he frantically tried to escape his plastic container. God too intently and compassionately observed my pains. God sees. He hears the cries of the afflicted. He has not overlooked. We discover these truths most intimately when we mourn before God, even if the mourning is about what he's asked of us. Without lament, we don't know the richness and the reality of the truths. Without lament, we feel and emote without also inviting truth to reign. In the months leading up to that walk, I'd felt the costs much more than I'd known the truths of God's perfect care. I hadn't given him opportunity to reach out his hands and take my concerns. Instead, I'd fostered my own bitterness, feeling the costs but assuming I'd nowhere to throw my pain. With each care I handed him, he didn't remove the costs or rescue me from the unchangeable. But he redirected my gaze by reminding me of Hebrews 12: "Let us also lay aside every weight, and sin which clings so closely, and let us run with endurance the race that is set before us, looking to Jesus, the founder and perfecter of our faith, who for the joy set before him endured the cross." The weight for me had been the costs of following and serving Jesus, heavy, because I'd tried to carry it without complaint, without shedding a tear, without acknowledging my own mourning. The sin was my self-fed bitterness, fed precisely because I'd not taken my tears to God. As a result, I wanted out. I wanted a different race to run, not the one God had clearly set before me. Only in gazing at Jesus did I see why God had invited me to mourn. Because the one who sees, who hears the cries of the afflicted, who has not and will not overlook the faithfulness of his followers, is one who knows the truest costs of all. Looking at Jesus, as Hebrews 12 tells me to do, I know what he endured will never be asked of me. Looking at him, I see that the costs are worth it. I can lament them before God, knowing he cares for me, but in the end know I'm secure from the worst lament possible. Following Jesus isn't all about costs. It's also about rewards. Jesus endured the cross in order to have joy. We too know rewards that only come through embracing the costs: peace, purpose, salvation, heaven. On the beach that day, in the midst of my tears, with unfixable things left unfixed, I began telling God about the rewards of following and serving him. They far outnumbered all that I mourned a few moments prior, and I'd only seen them so clearly after my lament. I wrote this as a reflection of Hebrews 12 that day. I hope it encourages you in whatever you're lamenting and in whatever race you're running.